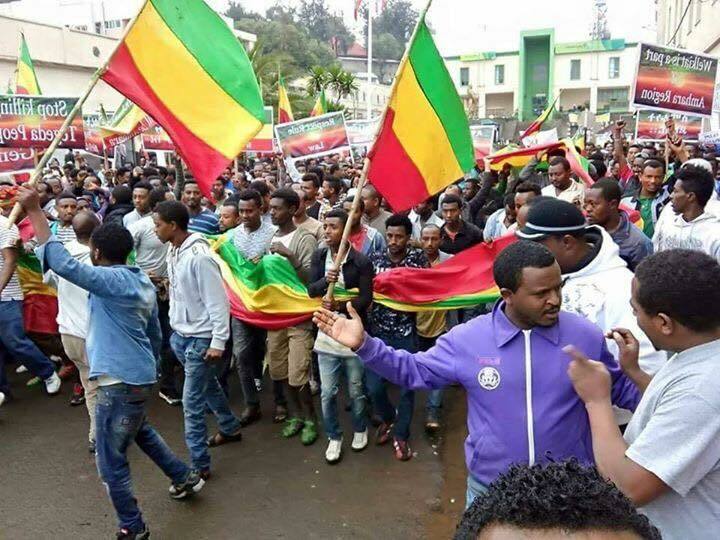 The people’s determined and peaceful stand to assert their rights on the one hand and the TPLF’s unreconstructed and brute response on the other does not bode well for Ethiopia’s peace and stability and regional tranquility in the near term. Sadly, repeated appeals over the years for genuine and incremental reform were cavalierly and arrogantly rejected by the TPLF. Instead, even the most innocuous vales for venting criticism were systematically shutoff. Thanks to its arrogance and barbaric actions, the people’s accumulated anger against the TPLF is now deeply and widely internalized and has metamorphosed into outright revolt. Hence we shouldn’t be surprised by the multifaceted irruption of this accumulated anger in almost all corners of the country today. At this stage, the people’s legitimate and long-standing demand can only be answered through a complete change of government and a new beginning. However, that is only one solution to one side of the problem. Equally important is the solution to the other side of the problem – how to transition a deeply divided and traumatized country to a representative and democratically elected government.Recent and forward-looking proposals to address these problems by some diaspora activists and opposition figures, although laudable, in my view seem to put the cart before the horse. I am talking about the recent announcement to hold an Oromo only congress with the aim of drafting a charter reflecting the desires and interests of the Oromo people. According to proponents of this idea, the charter will give basis for formulating negotiating positions for a subsequent enter-ethnic dialogue on what kind of polity Ethiopia becomes post-TPLF. There have been calls that others ethnic groups also should follow suit and draft similar charters for the same purpose. I’m afraid this approach is fraught with several problems and in the end may unintentionally put the people’s collective future at severe risk and may even scare away potential partners in and outside of the country. Firstly, such conferences if held should take place internally in the country, as fundamental existential decisions should only be taken on the widest and most exhaustive consultative process possible by the sovereign people inside the country. Otherwise outcomes of a foreign-based unrepresentative decision process risks credibility and even worse rejection by the people. I know it is impractical to undertake such an exercise inside the country while the TPLF is in power. But that doesn’t mean preparations on a credible general framework for future deliberations should not be made now. I’ll explain this later. Secondly, engaging in such exclusionary exercise is likely to siphon off the people’s individual and collective energy, which should be strategically targeted at their common and deadly enemy. The main focus of the moment should instead be on how to solidify the scattered opposition and apply collective pressure on the TPLF so we can end the suffering of our people and bring all protagonists to the negotiating table. Scattered and discordant struggle hasn’t brought the change people deserve and have been yearning for the last 25 years and I am afraid it won’t in the future. It can only bring reprieve to the TPLF and even worse could lead to endless infighting among the opposition. Thirdly, such thinking does not seem to acknowledge the huge trauma the country underwent as a result of the TPLF’s divisive and distractive policies of the last quarter century. Thanks for the rampant ethnicization of politics for an extended period; the country carries several faultiness and wounds. These agonies and wounds need immediate care and remedy before any individual or ethnic group can make informed, rational, and fundamental choice affecting this and future generations. I believe the most pressing task for the opposition and activists at the moment should be reaching an agreement on a broad-based vision and strategy for removing the TPLF and instituting an all-encompassing and credible process for collectively deciding the shape and form of Ethiopia post-TPLF. But the biggest risk I see in the exclusionist process is that such gatherings are likely to adopt maximalist and extremist positions in the hope of coming out on top in future inter-ethnic negotiations. To say the least this will make subsequent inter-ethnic negotiations very difficult and agreement far from assured. Even worse may unintentionally plant the seeds of unbridgeable chasms and endless internecine conflicts in the future. Such exclusionist approach also denies those individuals/parties that prefer to organize along ideological lines a say in the future of their country. I don’t believe all people want to live and raise a family in an ethnically segregated country. This is not the time to remedy historical wrongs. Instead it is the time to build bridges and collective strength. We should learn from the 25-years of failed ethnic politics of the TPLF and others in our immediate neighborhood. Ethnic-based atrocities have been committed against one another. So much blood has been shed. The people have been robbed of their properties without due process of law, uprooted and displaced from their homes, arrested and tortured, and expelled from their jobs or denied their livelihoods because of their political persuasion and/or ethnicity, etc. The country has been ransacked and plundered by the TPLF. Given this deep and pervasive trauma and anguish, the first order of priority post-TPLF should be healing this festering wound and pain through an open, transparent and genuine reconciliation process. Trust has to be rebuilt among individuals, communities, and religions through open communication, repentance, and forgiveness before reaching political consensus on the way forward. A credible process should also acknowledge the bond created by 25 years of shared trauma inflicted by the same dictatorship on all oppressed people. This sad but shared experience has interwoven a common desire to empathize with each other and live in justice and equality in a shared democratic space. The challenge for activists and politician today is to find such strands of commonality and hope among segregated and traumatized people and build a common movement for a promising future. The moment calls for envisioning and articulating a new political paradigm befitting a diverse, traumatized, and agonizing country that has preserved itself from foreign aggression through collective sacrifice over the centuries. Politicians and activists should work together in forging a forward looking system founded on the principles of justice and equality for all that acknowledges not only historical injustices and atrocities but also commits that they never happen again in the future. This no doubt is a tall order and perhaps more daunting than defeating the TPLF. But it should be done as the alternative could be even more gruesome and traumatic. Such a commitment would take a clear departure from the politics of the past and a profound faith in the goodness and greatness of our people. The task of reconciliation and systemic transition should be entrusted to a representative caretaker government put together by agreement among the democratic opposition. In addition, the task of rebuilding civil society, impartial governance institutions, and independent media should start now in earnest, as these are vital for a credible reconciliation process and eventual transition into a democratically elected representative government. The Ethiopian people and their true international partners are hoping that opposition leaders and activists this time around will answer the call of the people.